YouTube video on how to find your Perkins 4.108 engine serial number. This Tech Tip focuses on how to remove a Perkins 4.108 fuel injection pump. 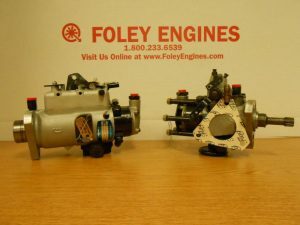 People frequently call us with questions about removing their 4.108 high pressure injection pump and what size wrench to use. The pump is held on by three nuts and three bolts. On a Perkins marine 4.108, the drive gear is directly behind the raw water pump. On a Perkins industrial 4.108, the front gear cover must be removed to gain access to the Perkins 4.108 injection pump drive gear. After disconnecting the fuel injection lines, use a 12mm socket to remove the three bolts that are located at the very front of the injection pump which holds the pump drive gear to the pump. After these three bolts are removed, use a 13mm socket to remove the three nuts that hold the injection pump to the block. The pump is now free. Had you first removed the three nuts that held the pump to the block, the pump would have flopped around making it difficult to unbolt the injection pump drive gear. P.S. This might be a good time to replace the awful cartridge-style secondary fuel filter on your Perkins 4.108 with a modern spin-on fuel filter. Please call us for details on our Perkins 4.108 conversion kit. It makes bleeding your fuel system much, much easier, saving batteries and relationships. See Tech Tip #112: Spin-on Fuel Filters for Perkins Diesels on our website for more information.